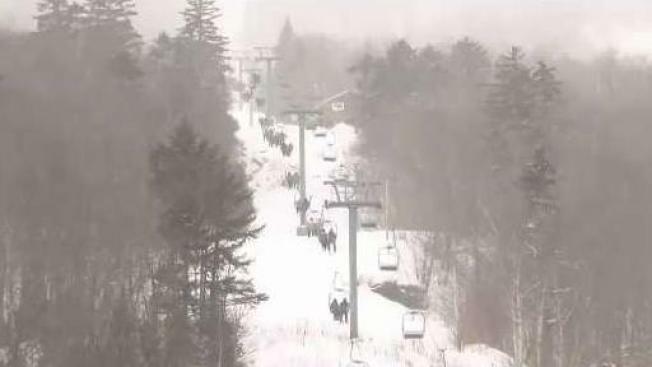 Skiers to one Vermont mountain were treated to severely discounted lift prices on Tuesday — all to celebrate the area's birthday. Between equipment costs, travel, and lift tickets, skiing often has a reputation as a pricey pastime. But not so at one Vermont destination Tuesday, where ticket prices were at ridiculously low prices. “Cheapest lift ticket I ever heard of,” skier Charlie Walsh said of the $3.50 lift tickets Tuesday at Mad River Glen in Fayston. In 1949, when Mad River Glen opened, a lift ticket cost just $3.50, and that old price was back for the ski area’s “roll back the clock” offer. “I think we’re having a negative impact on the gross national product today, and I think there’s a lot of truant officers not happy with us today,” joked Eric Friedman of Mad River Glen. Mad River, known for its historic single chair lift and skiers-only policy, offers passes at its opening day charge just once a year, to celebrate its birthday. This year, for Mad River Glen’s 70th anniversary, the rollback pricing drew a big crowd. “They could have a fabulous day today without spending a lot of money,” skier Carolee Ferguson said of her fellow skiers. Window prices at Vermont resorts generally range from $70 to more than $130, though most people do know how to bring costs down by booking passes online or sniffing out special offers. Still, they’ll never find tickets this cheap. Mad River said its rare $3.50 offer is possible because it’s co-operatively owned by skiers, with sport—not profits—as the founding mission in 1949. Walsh said he took advantage of his savings to reinvest in skiing. “I got my skis tuned and bought a new pair of goggles, so I was able to help out a local shop and buy some local gear,” he told necn. Prices at Mad River Glen go back to normal Wednesday. If you missed the cheap skiing offer, the tradition resumes the last Tuesday in January, annually.